Today we are interviewing children's book author Caldric Blackwell about his new easy read fantasy novel, The Missing Alchemist (book 1 of the Young Alchemist series). Thanks for coming back! It was only a few months ago that we interviewed you about your picture book, The Boy Who Couldn’t Cry Wolf. You’ve been busy! It’s a pleasure to be back! Yes, I have been busy! For readers who didn't read your last interview about your picture book, tell us a bit about yourself. I grew up in the Bay Area, but went to college in Santa Barbara. In college, I studied English and psychology. After writing short stories for a while, I eventually transitioned to writing children's books. My first book is an early chapter book called The Enchanted River Race. I followed that up with a picture book titled, The Boy Who Couldn’t Cry Wolf. Describe your new middle grade fantasy novel, The Missing Alchemist. The Missing Alchemist follows the story of fourteen-year-old Craig Pike. Having grown up in an orphanage, Craig appreciates his comfortable life as a student of Cornelius, a famous alchemist. But when Cornelius is kidnapped, Craig leaves comfort behind to search for him. This book is very different from your other books because it’s aimed at an older audience. What made you decide to write a middle grade novel? How was the experience of writing a middle grade novel different from writing your picture book, The Boy Who Couldn't Cry Wolf? It was the same in that it started with a very simple idea and grew from there. In The Boy Who Couldn’t Cry Wolf, I started with the idea of a young werewolf who has to solve a problem. In The Missing Alchemist, I started with a young alchemist who must rescue his teacher. Writing The Missing Alchemist differed from writing a picture book in that the development of the story was a lot more complex – more characters, more events, etc. All of the characters have histories and traits that made them fun to create. I think in this sense they were all fun to write. I think the most unique experience was writing Bert, a blacksmith. It was a unique experience writing him because he starts out as a minor character yet influences the direction of the plot in a major way. I can’t say anything more without giving something away, but keep an eye out for him while reading the book! Yes! I really liked Lemony Snicket’s The Series of Unfortunate Events. I love that they have this dark, gothic vibe yet at the same time are light-spirited and whimsical. I heard recently that Netflix is adapting the novels into a TV show, which should be interesting. What new middle grade novels are you excited about? I like Rick Riordan’s Percy Jackson & the Olympians series. I’ve always been interested in Greek mythology, so having a story that incorporates mythology with a fun plot is a winning combination for me. As I mentioned earlier, your last book, The Boy Who Couldn’t Cry Wolf, came out only a few months ago. You’ve clearly been busy! With all this writing, have you found time to do other activities? I have been very busy with my writing! It’s been quite time-consuming having two releases back-to-back, but I have been doing things other than writing. Balance is very important to me. I’ve found time to spend time with friends and family. I also recently traveled around California a bit. A lot of pictures of my adventures can be found on my Instagram: www.instagram.com/caldricblackwell. I’m currently working on the next book in the Young Alchemist series. I’m really excited about it because there are a couple revelations in The Missing Alchemist that are left somewhat open-ended for the sequel. 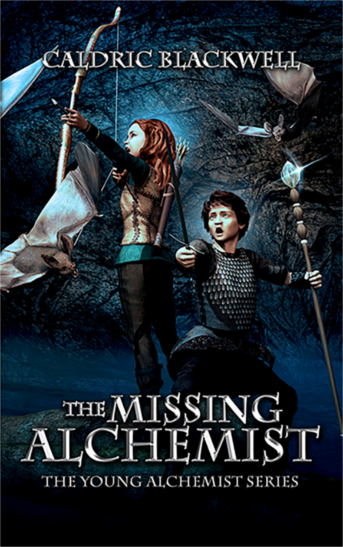 Anyone interested in learning more about my middle grade novel The Missing Alchemist or any of my other books can find more information at www.caldricblackwell.com.